Powers/Abilities: Sibylla possessed mystical abilities, including the power to fortell the future in prophecies, and monitor events in other planes of existence. After her death, her astral form continued to exist, with all of her powers. She wore a mystic amulet. History: (Doctor Strange II#46 (fb) ) - Two thousand years ago, Sibylla was born in Rome. Even in her childhood, she possessed the abilities of a seeress, and her fame spready quickly. In her adolescence, she journeyed to Mt. Gaurus, home of the temple of Apollo and Artemis-- and a Nexus of All Possible Realities-- to serve them as an oracle, communicating their messages to mortal men. Eventually, Sibylla's body succumbed to age, and Apollo offered her a place in Olympus as her reward, but she declined, wanting to watch over the Sibylline Sisterhood-- those who would succeed her as the Sibyls. And so, when Sibylla's body died, her spirit lived on within the temple, to guide her successors. (Avengers VI#2 (fb) - BTS) - Her amulet kept her tethered to the mortal plane. (Doctor Strange II#46 (fb) ) - Over the centuries that followed, the Sibylline Sisterhood flourished, until the title of Sibyls fell upon Thaleia, an insane prophetess, whose messages from the gods were distorted by her own madness. When Thaleia took poison and died, it was the end of the Sisterhood. However, there was still one prophecy remaining-- that of "the Black Oracle"-- which would require three Sibyls to combat. Apollo sealed Thaleia's spirit inside of her body, so that when the time of the Black Oracle came, she might redeem herself. In recent times, Sibylla came to realize the prophecy of the Black Oracle would soon come to pass, having seen another dimension where the Roman Empire never fell, and in the present, possessed highly-advanced technology. This Roman Empire had conquered all of the known galaxy, but had become soft with no enemies to fight-- until an evil goddess named Livilla contacted the Roman sorcerer Xennus, and informed him of the Nexus of Realities, and that the empire could find other dimensions to conquer. (Doctor Strange II#46)- Needing a third Sibylline, Sibylla mentally summoned the sorceress Clea to Rome, alongside her lover Dr. Strange. In a dream on the plane, she told Clea her history, and awaking, Clea and Dr. Strange journeyed to Mt. Gaurus, where they found it under siege by Roman Centurians from the other dimension, preparing for their assault. Venturing within the cave, they met Sibylla, who transferred her memories to Dr. Strange bringing him up to speed. She explained the prophecy of the Black Oracle to them, and how Clea would be needed to seal the Romans off from Earth 616. While Clea, Sibylla, and Thaleia's body formed a triad defense, Dr. Strange fought Xennus himself, and defeated him. With their combined strength, the three Sibylline sealed Earth 616 from the Romans, and Thaleia's body was finally allowed to turn to dust, her spirit sent to Apollo in Olympus. The Black Oracle averted, Sibylla allowed Dr. Strange and Clea to depart, then sealed up the entrance to Mt. Gaurus. (Doctor Strange: Sorcerer Supreme#54/2) - Sybilla summoned Bellona, an Olympian War Goddess, and informed her of the existence of Kyllian, who hosted three Celtic Gods. Considering those Gods their enemies, Sybilla encouraged Bellona to go after Kyllian. (Doctor Strange: Sorcerer Supreme#56/2) - Bellona's plot was foiled and she returned to Sybilla, who claimed to have forseen her failure, but wished to present her with a challenge. Bellona was angered and refused to listen to Sybilla's next vision, which showed Kyllian and Bellona locked in a romantic embrace. 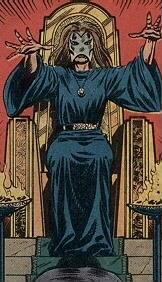 (Avengers VI#2 (fb) - BTS) - Appearing on Earth once more, Sibyl, using the mortal name of Sybil Aquila, became the head of the US Federal Reserve Department. (Avengers VI#2) - When most of the Avengers disappeared from time, Hercules, seeking Sibyl's help, asked Minerva where to find her. Minerva told her Sibyl now worked at the Federal Reserve Department. 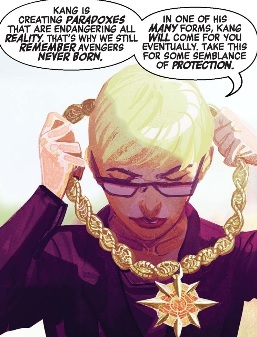 After learning that Kang had killed the Avengers as babies before they could become heroes, thereby creating a paradox that threatened reality itself, Sibyl provided Hercules with her amulet, remarking that she once wore it when she stood at the door to the afterlife. 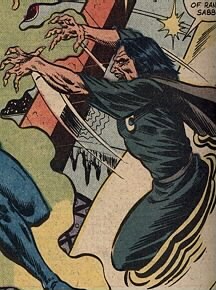 Thinking the amulet would provide protection against death, Sibyl revealed that her amulet would act as a tether to the mortal plane for Hercules and those around him, preventing Hercules and the surviving Avengers (who barely existed outside of time) from being directly affected by Kang's paradoxes. Comments: Created by Bill Kunkel, Dave Michelinie and Kerry Gammill. I'm not the only person reminded of that Star Trek episode "Bread and Circuses" am I? According to Sibylla, her temple, as part of the Nexus of All Possible Realities, exists in every dimension, much like the Excalibur Lighthouse once did. I am not 100% certain that Sybilla from Doc III#54+56 is the same as Sibylla. They are both prophetesses associated with the Olympian Gods, they wear dark robes, and the names are obviously ALMOST identical. However, given the fact that the Sibyl is established Greek mythology, and that twelve years occurred between the two sets of stories, it could be that the name is coincidental, and that Geof Isherwood had a similar vision for the appearance of the prophetess in 1993. No references or footnotes to any previous appearances are given. At the same time, both stories took place in Dr. Strange, and Roy Thomas (who has a pretty strong familiarity with the obscure characters from Marvel's past) was writing the front feature with Isherwood, so maybe Roy gave the info to Geof. Who knows? Straight from the horses mouth: As I was working on my Kyllian stories independently from Roy Thomas, I was not aware of the other Sibylla. I have to admit that although I wrote a number of stories for Marvel, and have read many thousand of them, I am not one to have an encyclopedic memory of characters. A further note: Sybilla was drawn older and hag-like as a deliberate contrast to the young, robust Bellona. <While> I don't recall the original Sibylla, but mine was true to the prophet role as attributed to her in myth. As I recall, Doctor Who Weekly did a similar storyline to the Doctor Strange Rome-World tale, right down to having a boy emperor for Rome, called The Iron Legion, reprinted in Marvel Premiere#57-58. That's right - the first Marvel comics Dr. Who strip was The Iron Legion. Profile by Prime Eternal, with an assist from Snood. Update by Proto-Man with a little extra work and image by Markus Raymond. Livilla an evil goddess native to the alternate reality of Rome-World, patron of Xennus, and the source of his power. 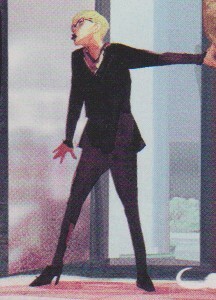 Livilla was aware of the other dimensions that existed outside of her own, and passed that information along to Xennus, encouraging him to set out and conquer other dimensions. Xennus was an evil sorcerer native to the alternate reality of Rome-World, the true power behind the throne of the Roman Empire, having the young emperor Tiberius Exter well under his thumb. After learning of the Nexus of Realities from his patron goddess (and power source) Livilla, he spearheaded the campaign to conquer Earth 616 with their forces. He attempted to pluck Dr. Strange from the field of combat, but did not truly comprehend how powerful the Sorcerer Supreme was, until they engaged in direct combat. Unable to match Strange's power, Xennus attempted to destroy Clea to break the Sibyllines, but Dr. Strange banished him into another dimension. For all Xennus' power, he was mainly a huge blowhard. Tiberius Exeter was the young boy emperor of the Roman Empire native to the alternate reality of Rome-World, although the true power behind the throne was Xennus. Tiberius was a weak-willed young man, always deferring to Xennus' judgements, despite his obvious distate for conquering other worlds. His council had been unsuccessful in finding new worlds to conquer, until Xennus came with news of the Nexus of Realities. He served as nothing more than a figurehead during the invasion of Earth 616, while Xennus commanded the military.